A few that recently caught my eye include this plaid midi-length dress and this cotton-flannel dress, both by Isabel Marant Etoile. With minimal accessories, you’ll have a cool fall look that’s comfortable, fashion forward and super versatile. This shirt dress is so pretty and this color is amazing against your skin and hair. 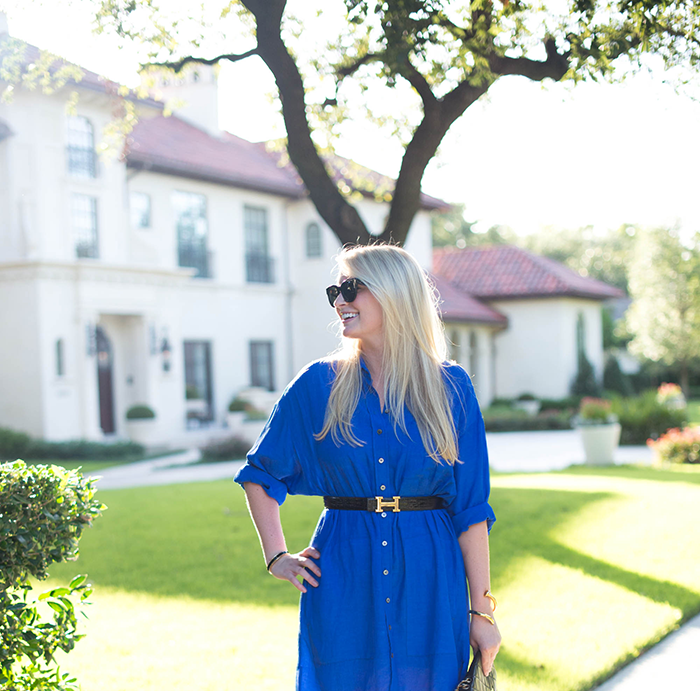 You’ve inspired me to pull out of my favorite cobalt shirtdress! You look fabuous. Beautiful shirtdress. The color is insane on you! Love it. I mean I would cinch this dress too if I had that belt! All your accessories (not to mention shoes) make this a seriously chic outfit! What a gorgeous blue dress, you look stunning! Love this color on you! Beautiful dress. Classic… and PERFECT. Love this Topshop shirtdress option! This dress is gorgeous on you. I also love a good shirtdress and this one is beautiful! Love that color! Such a nice look! This color is AMAZING on you! I love the cinched waist with the Hermes Belt- classic with a twist! You make it all look so effortless….thanks for your inspo on how to make the shirt dress look even classier!!! gorgeous! that color is so incredible on you. insanely stunning, M! Will be pinning this. So in love with this bootie trend… creates such a flattering leg line. what a seriously gorgeous look! love cobalt and black!! This dress is perfect! The color is stunning on you and that belt – YES PLEASE!! Head to toe perfection! Loving this simple and timeless dress! The color is exquisite and your Hermes belt is the perfect accessory! Black and blue sure look good on you! Love the dress belt combo! Super cute classic look lady! I agree shirt dresses are so versatile. Love you in blue! A shirt dress is on my current wish list! The boy looks beautiful on you! classic is right. i love this look, great choice in shoe.